Re-post from Cincom Corporate Blog about order prevention. Order prevention isn’t restricted to inventory shortages, point of sale errors or poorly designed customer portals. Even companies with highly trained sales forces and high performance Order Management Systems can stumble. Every sales rep has had this experience. The proposal presentation goes well, the pricing is accepted and everything points to a green light. The customer is excited, they sign and all that’s left is to enter the order. Back in the office, you enter the order and double check the quantities, model numbers and other critical information. Done! It’s beer-thirty, and you are buying! You pick up the phone and call the manager. You stammer and stutter saying, the customer has no preference; the default beige color is just fine! The officious voice informs you that there are no default colors anymore; the customer must specify the color desired. You have to go back to the customer and get them to sign a document stating they want beige. You protest, how can color be that important? The voice (now cold with fury) tells you that they’ve had too many returns due to color. People don’t like the standard color. The customer must specify a color in writing! Until then, the order is on hold! Or, how about this scenario . . .
You are wrapping up a deal with your customer, and the product is a perfect fit. The pricing is tightly aligned with value, and everyone agrees that this a perfect deal. And here’s my personal favorite, which I call “the secret limitation”. . .
You’re selling material-handling equipment for warehouses, and your biggest customer wants to buy 500 copies of your latest product — a high-capacity order-picking cart. The cart is just perfect for the narrow aisles and tight corners in their warehouse. Everyone is excited! This will be that big first order that product management and your sales manager have been looking for. The order is entered, and celebration dinner reservations are made. Your spouse is thrilled and tells you the cocktails will be ready when you get home! The next morning you drag yourself into the office, and the red message light is blinking on your phone. A voicemail from engineering is asking what you were thinking about when equipping this cart with four swivel casters. The weight! The high center of gravity! The tipping hazard is a product liability nightmare! You call the head of engineering. Your customer has to have four swivel casters! They can’t turn a two-swivel cart in their narrow aisles! The reason they want the product is the high capacity and the maneuverability afforded by the four swivel casters! The cart is only available with two swivel casters! No exceptions! Who do you call to get this resolved? You’ve reached the order prevention department. All of our agents are busy now preventing other orders, so no one can speak with you at this time. Please select from the following options . . .
Press one to leave an expletive-filled rant. Press two to beg for an exception to our official policy-driven unreasonableness. Press three to offer money or ballgame tickets in exchange for a policy waiver. Press four to learn how to open the veins in your wrist. What’s happening here is order prevention. It’s a process found lurking in most companies, so don’t feel special. Even though you can’t get a degree in order prevention, it is a very popular course of study for on-the-job training. Some companies are finding that order prevention can be managed. Your customers and employees do not have to be frustrated and treated like they are doing something wrong. Order prevention takes place when people feel it is safer to hide behind a written policy than to ignore or change the policy when faced with a situation that is even slightly exceptional. It is exacerbated by individuals who enjoy wielding some form of power over others — especially those who they see as unjustly advantaged. Order prevention thrives in companies that do not adequately provide information to their employees regarding process, product or price. 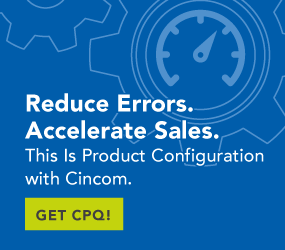 CPQ (configure-price-quote) technology can make order prevention a thing of the past. How? CPQ builds all questions related to the product, pricing and order fulfillment into a question-and-answer script. The order will not move forward without a color selection or shipping instructions selected or specified. The rep and the customer move through the script over the course of the sales engagement. All of the troublesome “little” details are discussed and resolved upfront before the order is ever entered. When special needs are identified, they are identified early on in the engagement. The right people are involved in the discussion, and the right solution is applied to the exceptional problem. There is no last-minute surprise that must be resolved. There is no order prevention.